Vibration measurement is expensive and difficult but there are new devices delivering accurate and repeatable measurements at a moderate cost. 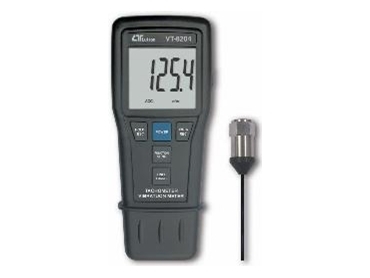 An example of this style of instrument is the Lutron VT-8204, available from ECEFast , which incorporates a laser non contact tachometer and a contact tachometer with wheel for linear velocity measurement. Data can be logged on demand, or at time intervals up to 1000 points and downloaded to a PC for analysis with optional software. The Lutron VT8204 vibration meter can play a part in a condition monitoring programme for rotating machinery, or for comparing operating conditions with allowable limits of vibration, for example, to protect structures. The sensor supplied has a magnetic base, which may be unscrewed, for non-ferrous targets and special fixtures may be required such as bond on studs.